I recently discovered the amazing Aloe Vera Juice benefits when I started drinking it to improve my digestive system health. 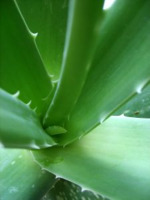 I used to associate Aloe Vera with skin preparations like for sunburn, or shampoo ingredients and other beauty products. Taken internally as a juice, Aloe Vera has great benefits for the whole body and especially the digestive system. Here is a brief summary of Aloe Vera Juice benefits that you should know about. Cancer patients have found that Aloe Vera juice helped to increase energy, reduce nausea and may help to minimize low blood counts caused by chemotherapy or radiation. It also speeds up the healing of radiation burns. For over 3,000 years the digestive health benefits of aloe vera have been widely recognised. Improves conditions such as ulcers and asthma. Aloe Vera Juice has shown to bring relief from problems associated with digestion such as irritable bowel syndrome or IBS (also known as Spastic Colon), Colitis, diverticulitis and Crohn's disease. What it does is help to break down the impacted matter and bring relief from the build up of toxins in the digestive system. Aloe vera juice can detoxify the body and improve blood condition. Aloe juice can also be used internally to reduce inflammation throughout the body from the inside out (provided you stop doing/eating whatever is causing the inflammation). Topically, Aloe Vera gel is well known to ease joint inflammation thereby reducing arthritis pain). One of the lesser-known benefits of Aloe Vera is that it is a potent immune-system booster. Aloe vera juice benefits include boosting immune function to encourage the body to destroys cancer tumors. Aloe vera juice benefits diabetics by helping stabilize blood sugar. How Does Aloe Vera Juice Work? Aloe vera contains the following substance that give it the powerful healing properties: Cinnamic Acid has anti-fungal and parasite-fighting abilities, Lupeol is anti-inflammatory and anti-arthritic, Salicylic Acid has antiseptic and antipyretic properties, and Phenol is a natural anaesthetic. There is only one good way to ensure you get the highest quality natural aloe vera: Grow it yourself. The typical aloe vera liquids available in retail are very weak, and some contain almost no aloe vera juice whatsoever. Be warned though, taking aloe certainly isn’t a magic cure. It won’t reverse your disease after drinking one glass of aloe vera juice. It needs to be used regularly with possible lifestyle or dietary changes depending on your situation. Most people report positive results in 3 - 30 days, depending on the condition. The best part about the health benefits of Aloe Vera juice is that it is completely natural and the effects of aloe are gradual, gentle and with no irritant or harmful side effects.